Temple bells are part of rituals ~and are considered sacred. At the holy Thirumala, as is in all Temples, the bells toll every day during temple rituals. 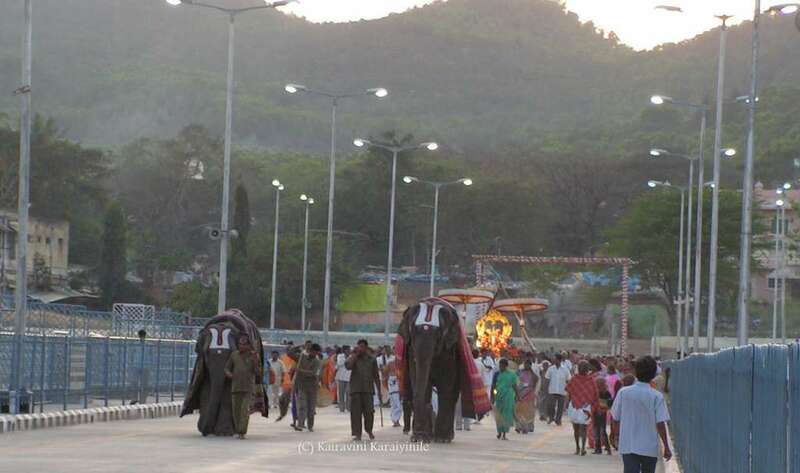 Devotees would observe the two huge bells [Gaanda mani] within the precincts of the temple, upon coming out of the sanctum sanctorum of Thiruvengadam Udaiyan. It is believed that the twin bells in the Temple were installed in 1417 by a king of Vijayanagar empire. The bells reverberate during the pre-dawn rituals like Thomala Seva, Archana, Koluvu and more importantly during the time when the priests offer ‘Thiruamudhu’ [neivethyam – offering of food]. As the history of the temple goes, the ornate Mukha Mandapam also called as ‘Mani Mandapam’ where the two-bells are installed to a huge beam was built in the year 1417 by Vijayanagar king Amathya Mallana.The kings were said to have built a chain of Mani Mandapams between the Tirumala temple and the Chandragiri fort with such an engineering symmetry that they served as ‘relay stations’ to carry the sound-waves from the bells from one place to another. It is believed that the Vijayanagara kings, while on their sojourn in the Chandragiri fort, located around 12 km from Tirupati down the hill, used to take their food only after the bells were tolled. Today’s the Hindu report that the Welding Research Institute (WRI) of the Bharat Heavy Electricals Limited (BHEL), Tiruchi, has repaired and handed over a vintage temple bell belonging to Arulmigu KaligaParameshwari Temple at Periya Kammala Street in Tiruchi. At a function held at WRI today, S. Gopinath, Executive Director, BHEL, Tiruchi, handed over the bell to the temple trustees led by S.Rajendran.A special puja was performed by the temple priest at WRI for the bell which is over 100 years old, in the presence of Mr.Gopinath and other senior officials. The original tone of the bell has been restored. 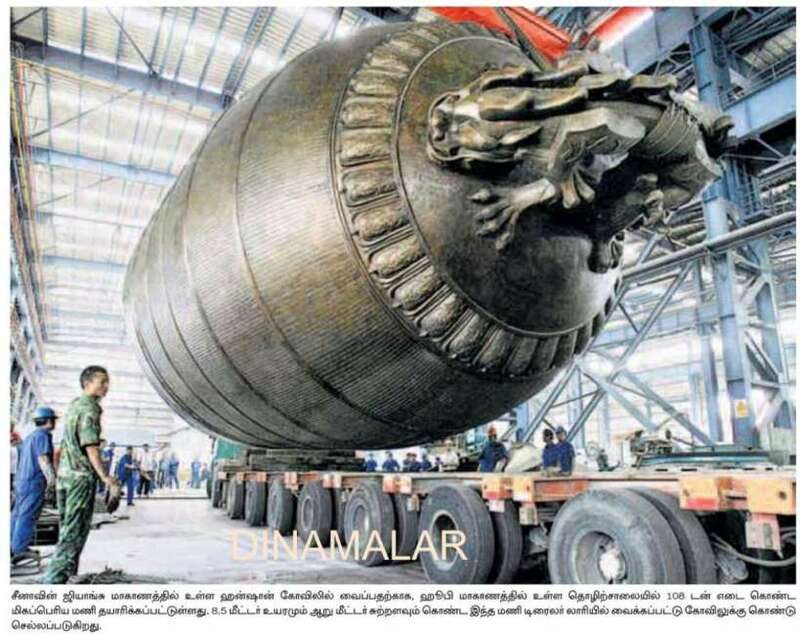 Describing the complex repair welding process, R. Easwaran, General Manager, WRI & Labs, said the bell made of brass, weighing over 75 kg and about 1.5-foot tall had been out of use since 1988.It had developed a large crack of over 150 mm in length due to prolonged usage and needed repair. A special fixture and heating burner were developed and the temple bell was welded at controlled temperature using special consumables and flux. The welding was done by the young welders of WRI, who had been mentored by welders with experience in such intricate welding. 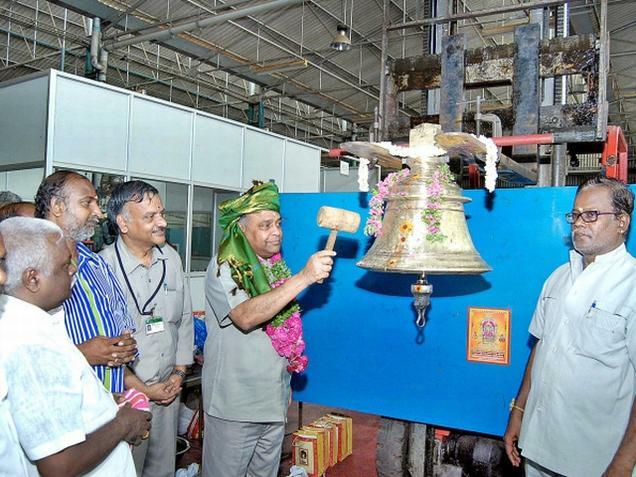 So far, over 50 such bells belonging to various temples and churches in Tamil Nadu have been re-conditioned by WRI including the one at the Rockfort temple, a BHEL press release said. Thousands of mile away, lies the Hanshan Temple (literally: "Cold Mountain Temple"), a Buddhist temple and monastery inSuzhou, China. Traditionally, Hanshan Temple is believed to have been founded during the Tianjian era (502–519) of the reign of Emperor Wu of Liang, in the Southern and Northern Dynasties period. There are two bells currently used at Hanshan Temple, both dating from the late Qing Dynasty when the temple was last rebuilt. One was forged in China in 1906, and the other was forged in Japan at around the same time. The dedication on the bell was written by Japanese Prime Minister ItōHirobumi. A few years back a new 108 tonne bell was made in a foundry in Wuhan; the bell is 8.5 metres high and 5.2 metres in diameter at its widest. Here is a photo of the bell in transit – courtesy Dinamalar.